As Toronto’s mayoral race enters its final, frenzied stages, it becomes nearly impossible to keep track of all the candidates and their antics. Here for you: a handy weekly summary. After denying she would ever leave the race for mayor, Sarah Thomson dropped out this week. Her candidacy matured a lot over the course of her campaign, but she’s now backing George Smitherman, and has dedicated her small resources (7% of the vote, her Twitter feed) to his campaign. Her name will stay on the ballot, because those are the rules. But what else happened this week? A medical doctor stood up at the condo owners’ debate on Thursday and expressed his professional concern about Rob Ford’s weight. George Smitherman mouthed “Wow” and Ford called the comment “offensive.” Rumours flew that the questioner might have been planted, but nobody could dig up any dirt. Later that evening, Smitherman left the building before the Toronto Community News debate began. A woman confronted him outside to ask unforgiving questions about his record as the Ontario Health Minister. He tried to deflect and defuse, and then he left. Since he was only going to stay at the debate for fifteen minutes before leaving for a fundraiser, his choice to leave doesn’t seem quite as cowardly as other candidates claimed. Smitherman and Ford released their comprehensive financial plans, and Toronto Life offered a good rundown of both. Ford’s proposal (which came with a handy video guide) is a predictable and predictably shaky list of how to cut costs and cut taxes. His hallmark promise to cut the number of city councillors in half makes it especially hard to take the rest of his plan seriously. Smitherman’s plan, meanwhile, relies on $100 million in funding from the provincial government. For a city that hasn’t been getting its weekly allowance for some time, that’s a large sum to count on. Is Smitherman using his friendship with McGuinty to build a budget? Thomson’s departure to support Smitherman put pressure on both Rossi and Pantalone to justify their continued candidacies. Even though his advisors might not agree, Rossi plans to stick it out. At least for now, that is his story and he is sticking to it. And with a man like Dean Blundell (from 102.1 The Edge) calling Rossi “pretty much the only person qualified to be the leader of our city…and the only guy with a plan,” how could he not succeed? Pantalone is convinced that he owns the progressive vote, and is likewise not planning on dropping out. When the Sun declared “Pantalone’s not going anywhere,” Pantalone ignored the subtext and is now using the phrase as a declaration of his plan to stay in the race. 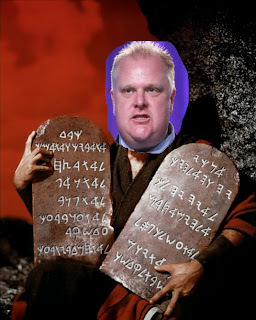 Ford is starting to realize that he won’t have the support of council unless a lot of incumbents lose their seats. While Ford is not a strategist, his astute campaign has started targeting wards where incumbents are vulnerable by contacting other candidates and possibly offering them support. Last Monday, the Toronto Cyclists Union invited all the candidates to take a ride during the downtown morning rush hour. Only Rossi and Pantalone showed up. Pantalone somehow managed to look adorable again by riding in a rickshaw—he never learned how to ride a bike. As for Rossi, he must have had an epiphany, since the next day he recommended protected bike lanes on Wellesley, Harbord, Sherbourne, and St. George. Smitherman paid his dues by signing up for Bixi Toronto later that day. As for Ford, he doesn’t even like runners. Maybe it’s the internet, but other campaign content is harder to understand. Rossi’s recent ads were so bad they looked like a hoax, and he has since pulled the posters from his website. Pantalone’s new campaign has been Photoshopped already, and Ford’s face has started appearing on the body of ghosts, and Moses. We’re not even sure what’s real anymore. Just watch. That’s it for this week. Remember: the candidates’ lawn signs are coming on Monday! Stay tuned for next week’s chronicle of all the candidates’ capers!